Read a random fortune cookie. 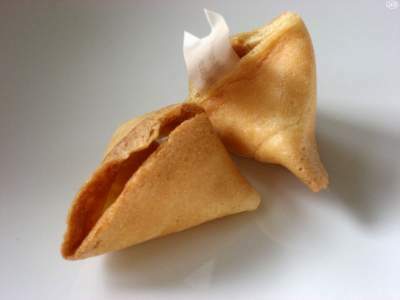 Free online fortune cookie. Click here to reload this page to read yet another clever fortune. How can you not read a fortune cookie? Even if you don’t eat it. After you read it, do you share it with others? Add ...in bed to the end of it? Save it for later? BTW, all of the fortunes on this page are my own original text. You won’t find them in the fortune cookies you get at a restaurant. No Wonton Food fortunes here.